Fifty singers and musicians perform original songs of travel and journeying, celebrating both the local Tamar Valley line and the journeying of refugees travelling from the African continent, now residing in Plymouth. 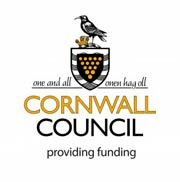 In 2014 this extraordinary project, funded by FEAST, launched the Calstock Jazz & Blues Festival. Due to its overwhelming success, selling out twice over and seen by more than 300 people in Calstock, it is now being staged at the Plymouth Barbican Theatre. Young Nigerian singer and composer Mark Samuel, and djembe player Chanda Nyerezani, whose own journeys are explored in the second half, perform with Calstock’s Big Jazz Choir under the musical directorship of Helen Porter. Also performing are multi-instrumentalist and singer Anna Batson, who has composed songs especially for the project inspired by the refugees, and double bass player Mike Thorn. 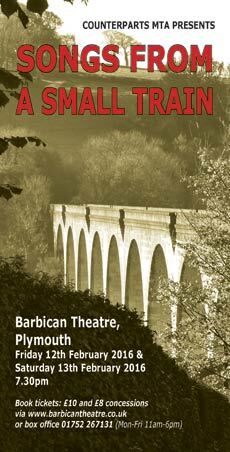 Click here to download the premiere programme of Songs from a Small Train as performed in Calstock, October 2014.